Reflections on “The Selling of Attention Deficit Disorder” – Robert Berezin, M.D. I found “The Selling of Attention Deficit Disorder” by Alan Schwarz, December 14, 2013 on the front page of the New York Times, a courageous article. If only it could have been published years ago. 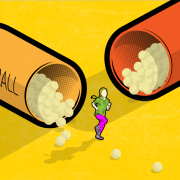 In general it is difficult to get such an article published because the drug companies are so powerful, they put a lot of advertising pressure on publications. As a practicing psychiatrist for forty years, I take the condemnation of the use of amphetamines a step further. There is no place for the use of amphetamines for psychiatry or medicine, never mind for children. Call it by any other name, it is still “speed”. It was discredited in the 1980’s after an earlier period of abuse as an anti-depressant and diet pill. It was mostly used as a street drug. Our in-patient wards were filled with amphetamine psychoses and addictions. It was originally concocted by the Nazis who used it very effectively for the Blitzkrieg and for its pilots in the bombing of Britain. But then a strange thing happened. A new medical-psychiatric genetic brain disease got invented: ADHD. And what was the treatment of choice? You guessed it. Suddenly, speed was safe again, non-addictive, no side effects, and it didn’t generate psychoses anymore. Its sordid history went right back into amnesia. Apparently, the past didn’t happen, so we certainly don’t have to learn from it. There is no credible and definable criteria in the brain for ADHD. Yes there are certain kids with an active temperament. If they do not have the proper boundaries and discipline at home they will spin out of control. These kids do not need speed. They need proper interventions in the family so they will go back into balance and be happy and productive kids. Instead of the current idea that adults have his condition as well, we need to go back to the 60’s and 70’s and before, when there were no kids who conducted themselves this way. It was unheard of. It wasn’t under diagnosed it didn’t exist. The only thing I differ with in this article, is that it gives some credibility to the idea that there are a smaller number of ADHD children who apparently should be on amphetamines. Even this is not true. I do not have medical credentials and you will no doubt therefore disregard my rebuttal. Nevertheless, I utterly disagree with your premise that hyperactivity is a problem of categorization and observation, rather than a condition resident in the children described. It’s not just a simple matter of discipline or proper child management. I grew up in the 50s and 60s and knew children who absolutely could not be contained, who were literally bouncing off walls with so much energy. Containing them, effectively, by their exhausted and exasperated – and committed – parents would have required physical restraints and perhaps even methods we would have regarded even then as abusive. When these children were placed on a regular dosage of (typically) methylphenidate, the change in them, and improvement in functionality, temperament and ability to do their schoolwork, was remarkable. They were not “robotic” as a result of being medicated. Quite the opposite of the usual amphetamine effect, they calmed down. Granted, the diagnosis seems to have become, shall we say, fashionable (yes, an odd choice of word) in the present day, with a kind of medical regimen du jour attached. Our society has become much more rapidly paced, with digital technology and other pressures bearing down on children. Thus, more mild “cases” of over-activity which could previously have been managed with social conditioning and such, now are more noticeable in light of those pressures and expectations. 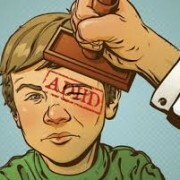 That said, it is simply incorrect to deduce that ADHD has never existed. Thank you for your thoughtful comments. As you know I disagree. It is true that certain children with an active temperament in relation to other temperamental qualities are capable of spinning out of control. These are regular kids who would profit from a family exploration and intervention. With proper boundaries (and love) in the home environment, these kids transform, without amphetamines. And this is not so difficult. One of the things I have learned in my forty years of psychiatric practice, that people outside the family do not know the realities inside the family. So-called ADHD is not a brain disease. And remember that no evidence in the brain to support such an idea has ever been demonstrated. Fundamentally there weren’t any of these so-called ADHD children forty years ago. There were an occasional few children who were then called by the wastebasket term ‘minimal brain damage’. This meant nothing and was a demeaning label. And they simply needed a proper intervention, not drugs, then. That there is an apparent epidemic of ADHD today raises some very important questions. Unless one thinks that something in the water created an epidemic of brain damage, we need to look elsewhere. And the elsewhere is the problematic raising of our children. In other words kids with certain temperaments can spin out of control. Children of other different temperaments will exhibit other symptoms. Children with other temperamental attributes are now being diagnosed with so-called depression. They are classified as having a different brain disease and are put on SSRI’s. There is an epidemic of anxiety to be treated with Benzodiazepenes. And, speaking of fashionable diagnoses, there is an epidemic of ‘Bipolar’ with more heavy duty psychiatric drugs in children! [I do not use the term bipolar. I reserve this for batteries not people. We are talking about Manic-Depression]. There are some people who have the legitimate diagnosis of Manic-depression which is a major destructive mental illness. There is no such thing as the widespread prevalence of “bipolar” disease. With all these phantom brain diseases, once they are believed, the epidemic gets expanded because then suddenly we find there is a huge number of ‘milder cases’. So they too are put on drugs and told that they are brain damaged. 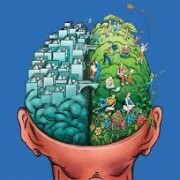 How can such a huge percentage of our children be brain damaged, one way of the other? And how is it that putting children on Amphetamines, never mind all the other drugs, is thought to be a really good idea? We need to get back to an appreciation of childhood, and understand the forces which act upon our children’s varied temperaments. Something has spun way out of control, and it is today’s view of that a huge percentage of our children are brain-damaged.